Get an in-depth tour of OpenShift, the container-based software deployment and management platform from Red Hat that provides a secure multi-tenant environment for the enterprise. 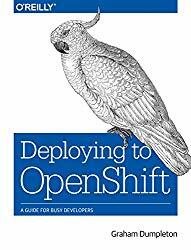 This practical guide describes in detail how OpenShift, building on Kubernetes, enables you to automate the way you create, ship, and run applications in a containerized environment.Author Graham Dumpleton provides the knowledge you need to make the best use of the OpenShift container platform to deploy not only your cloud-native applications, but also more traditional stateful applications. Developers and administrators will learn how to run, access, and manage containers in OpenShift, including how to orchestrate them at scale.Build application container images from source and deploy themImplement and extend application image buildersUse incremental and chained builds to accelerate build timesAutomate builds by using a webhook to link OpenShift to a Git repositoryAdd configuration and secrets to the container as project resourcesMake an application visible outside the OpenShift clusterManage persistent storage inside an OpenShift containerMonitor application health and manage the application lifecycleThis book is a perfect follow-up to OpenShift for Developers: A Guide for Impatient Beginners (O’Reilly).